After going through the ups and downs of breastfeeding with Crystabel a little over 2 years, I was all ready to get back into the routine again with Callum. Since he was delivered via C-section, I was mentally prepared that my milk might not kick in as fast this time and there’s a possibility that he might need to be formula-fed on the first few days. But then my body surprised me yet again! Not only was my milk already available just hours after birth, I couldn’t believe that the actual supply came rushing in by the third day. So much so that I had to start pumping while still in hospital. And there I was thinking that I could at least rest for the first 2 weeks and just concentrate on latching. And with that, the endless latching and pumping sessions began. I didn’t have any issues with having enough milk to meet Callum’s intake. In fact, I had an oversupply and was donating my excess frozen stash to several low-supply mummies. You would have thought that that made my journey a breeze and a dream, right? Well, like all things in life, sometimes it’s not as simple as that. Latching around the clock to a milk guzzler was tiring. That coupled with dealing with a colicky baby. And then, there was a need to pump as the little one was not able to empty my breast since my supply was more than what he drank/needed. After that, there were bottles and flanges that need to be washed up and sterilised – thank goodness sterilising is made a breeze with the UV steriliser (best investment ever!). To add on, there will always be others around you who would try to question (or challenge) the decisions you make with regards to breastfeeding. Things such as, “Why don’t you bottle feed more often – then you don’t need to rush through your meals!”. Well, being an over-supply mum, when I switch a latching session with the bottle means that I would need to add on the number of pump sessions to even things out. Now, why would I want to do that?! There were a few times throughout my breastfeeding journey that I wished that I could just end it right there – mostly due to frustration and dealing with postpartum blues. But then I made myself snap back quickly with a reminder on how precious the journey was and how it would give Callum the best and how he won’t be this tiny and dependent on me for long. 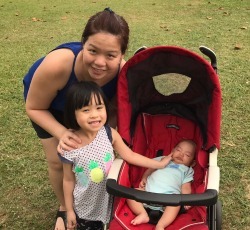 With all that, I knew that whatever I was going through – yes, even the rough patches – was worth it and I’ll always have this in my memory to look back at many years from now when both the kids turn into raging teens! Fortunately, this time round, I didn’t have that many road blocks or technical difficulties except for 2 minor cases of blocked ducts which I managed to clear – thanks to the help of the mummies on the breastfeeding mums support group. Also, pumping at work was relatively easy this time. I was spoilt for choice when it comes to finding a place to pump (I’d usually occupy one of the available rooms in my office or make my way downstairs to the building’s nursing room if there’s no room available in the office). And I am glad that my workplace is very breastfeeding friendly – thanks to the support of my boss and team, as well as other colleagues from other departments. Without all these plusses, I don’t think I’d be able to make it this far. With just a blink of an eye, the little man turns 1 year old – which means I have been doing all these for 12 months and counting! Truth to be told, although this is not my first time, I feel relieved to hit this one year mark. His milk intake is not as much as before, so I don’t really need to push myself to keep up with his needs. Besides, he is eating and growing well – and I am trying to gradually drop my pump sessions and switch to latching whenever he’s with me. I often get asked the question “how long as you going to breastfeed for?”, and while I would love to say something like “for as long as he wants to”, I know that I might not have that kind of energy to fulfil my words as it does get tiring. So for now, I’m just taking things one step at a time by looking towards the breastfeeding milestones ahead – 12 months, 18 months, 2 years.